Mobile Museum now booking for 2018-19! Bookings are available now for 2018/19! 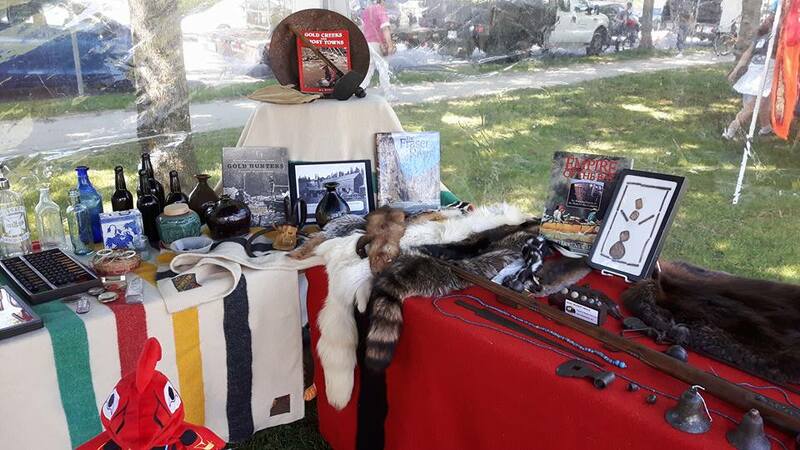 The BC Artifacts Mobile Museum Tours consists of an extensive collection of authentic BC First Nations, Pioneer, Fur Trade, and BC Gold Rush artifact displays as well as a very engaging and informative Power Point presentation and story. 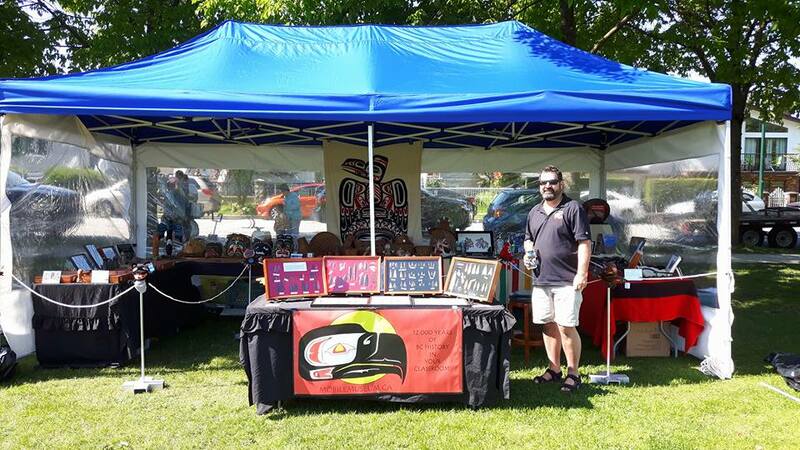 It is all presented by Tony Hardie, descendant of early British Columbia Pioneers and the Secwepemc First Nation. 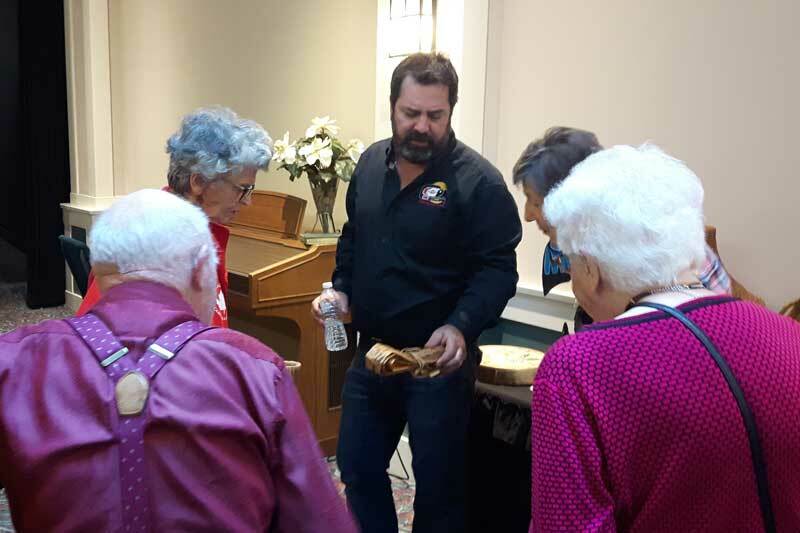 The BC Artifacts Mobile Museum is currently Presenting at many BC public and private schools, hospitals, community events, and elder retirement and care homes. Thank you for all of the continued support and positive feedback! Once again, I would like to thank all the Principals, PACs and everyone else that made 2017-18 school year a very busy one for myself and the BC Mobile Museum Tours. 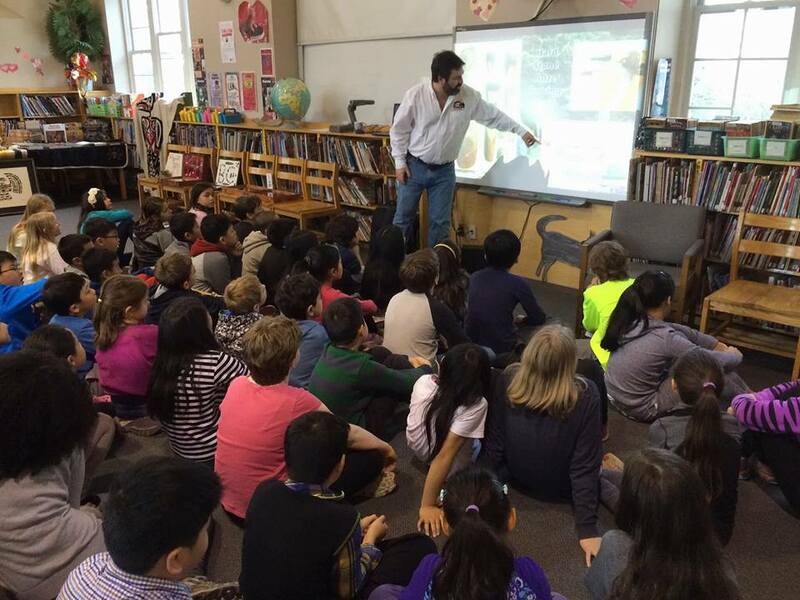 What an amazing year it was presenting at events during “Cultural days” at Langley Centennial Museum, “Collingwood Days” in Vancouver and to students and staff in over 50 different public and private schools throughout the Lower Mainland including areas as far away as Lytton, Lillooet and Salmon Arm. Don’t delay to insure you get the date or dates you want. Please visit the www.MobileMuseum.ca website for more information, references and booking availability. 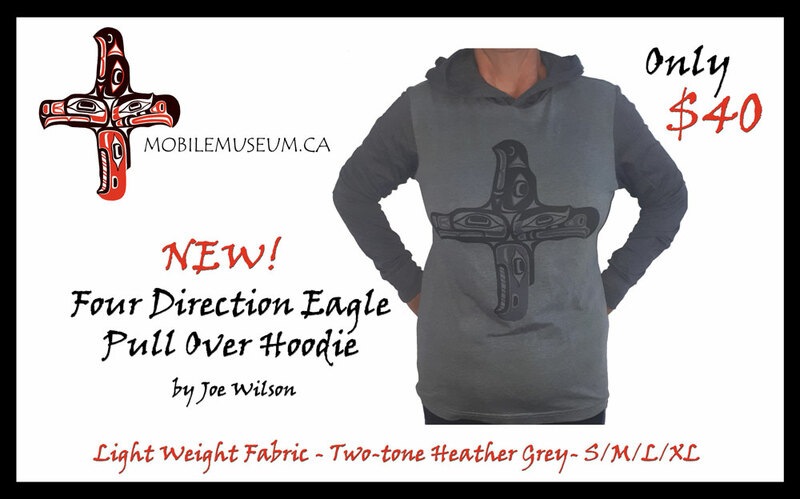 Four Direction Eagle T-Shirts by Joe R. Wilson Kwakwaka’wakw Native Artist from Alert Bay British Columbia. Order your Shirts online here! Also available in pullover and zipper hoodies! 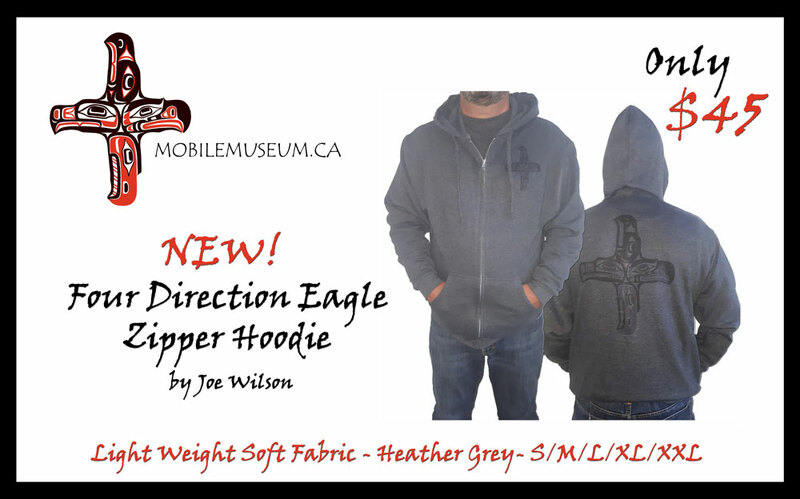 Order your Zipper Hoodie online here! Order your Pullover Hoodie online here! 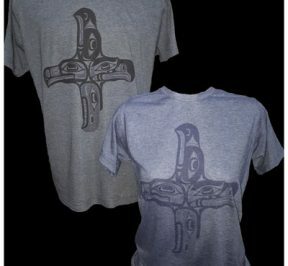 This eagle design used expresses the unity and common elements shared by the First Nations of the BC North(left), The BC West(bottom) and Kwakwaka’wakw(right) and the Salish(Top). It also depicts the 4 directions and the central connection we share. Each of the eagles were created in traditional form and are culturally correct to each region, respectfully representing the 4 different indigenous art styles. Thank you for your support! 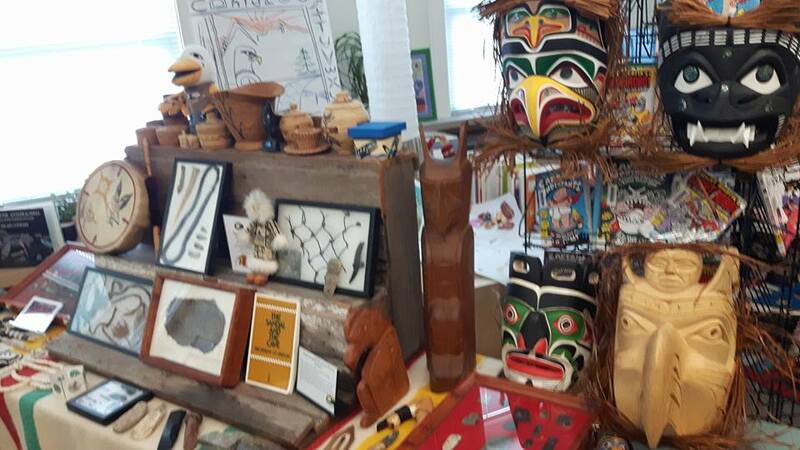 All proceeds from sales currently go to adding, improving and maintaining the collections used in the BC Artifacts Mobile Museum Tours. 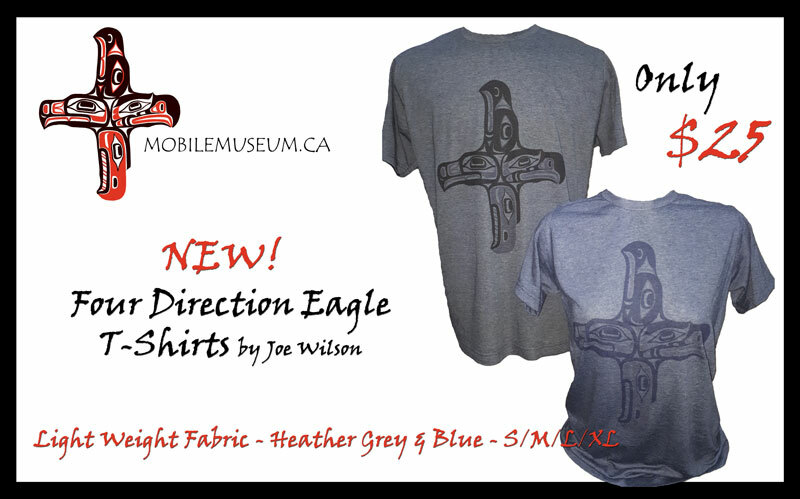 BC Mobile Museum 4-Direction Eagle T-Shirts are Available Now! Thank You to all BC Schools, Principals, Teachers, PACs, Event Coordinators, and Students! Yay! The summer is here! 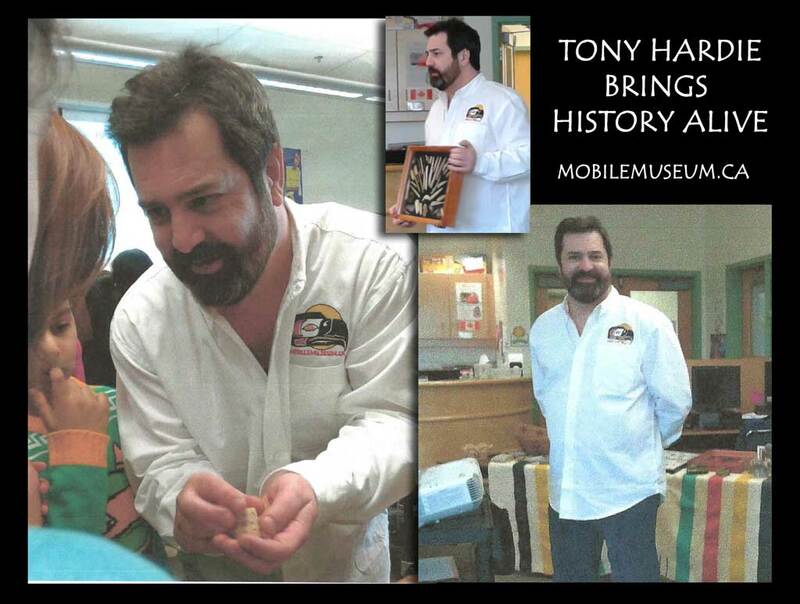 I would like to thank all those who I was invited Myself and the Mobile Museum to present during this past year at all the public and private BC Schools. I would also like to thank all the Principals, PACs and everyone else that made 2017-18 school year a very busy one for myself and the BC Mobile Museum Tours. What an amazing year it was presenting at events during “Cultural days” at Langley Centennial Museum, “Collingwood Days” in Vancouver and to students and staff in over 50 different public and private schools throughout the Lower Mainland including areas as far away as Lytton, Lillooet and Salmon Arm. 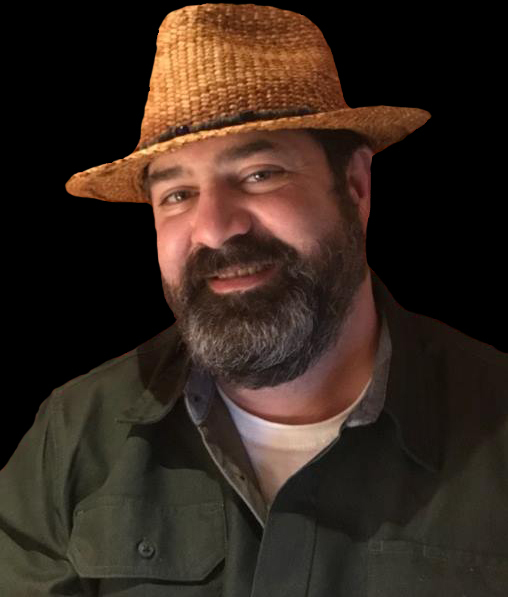 I am also looking forward to presenting once again in 2018-19 with tours currently being booked throughout the lower mainland and other BC communities. 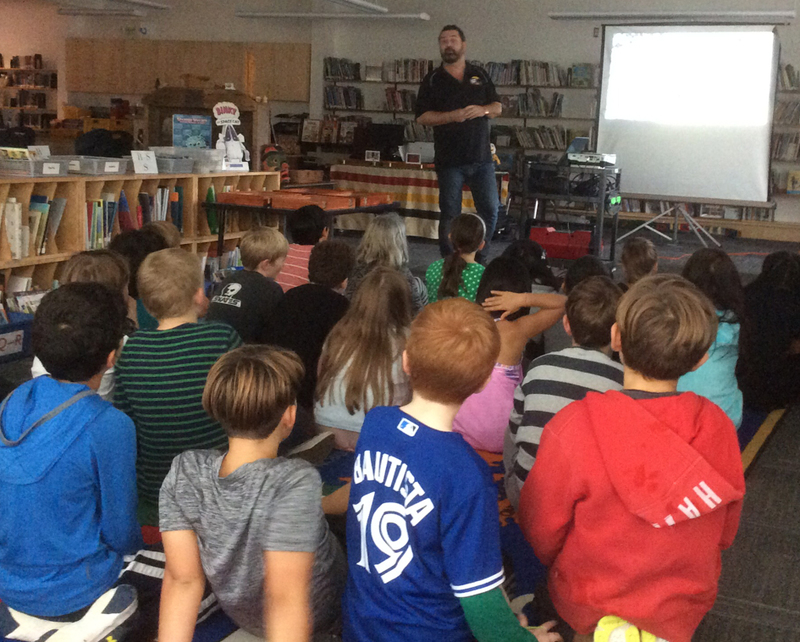 There are many dates remaining available but I recommend that you book your event or school presentation date(s) early to ensure your preferred month and time. Contact me directly at 778-386-3110 or visit the www.Mobilemuseum.ca website for more information, pricing and booking availability. 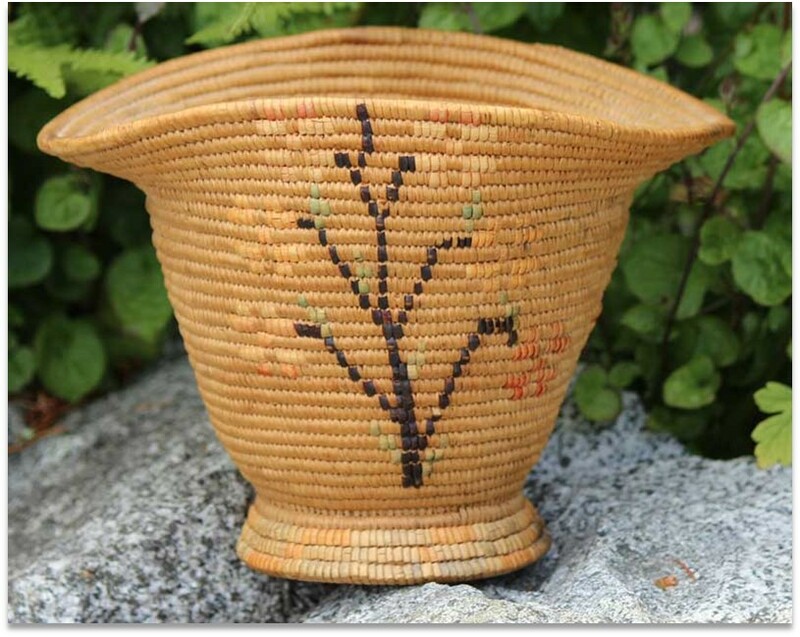 As a Basket collector I have always admired the weaving of the Pacific Northwest. 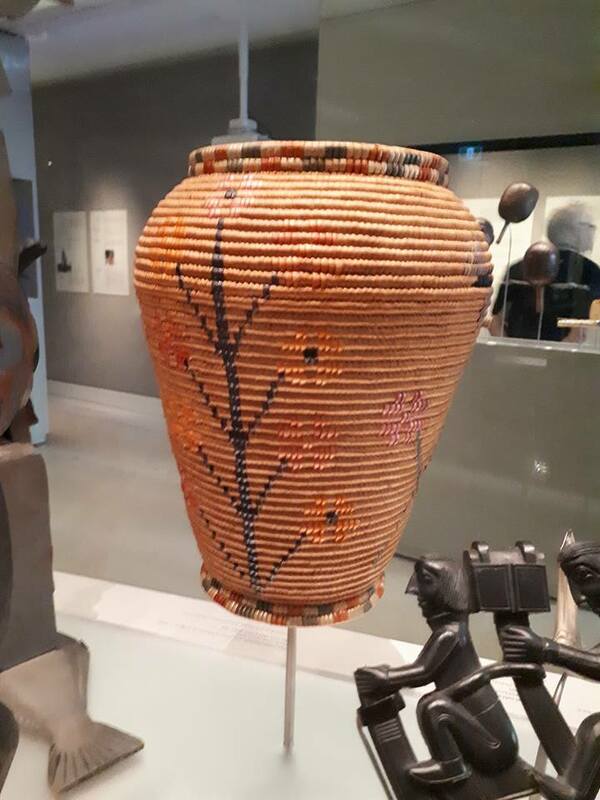 You can only imagine how excited I am to have recently found out one of my Great Grandma’s baskets is on display in a Museum of Master Works right here in BC! Pretty cool to find this on display! 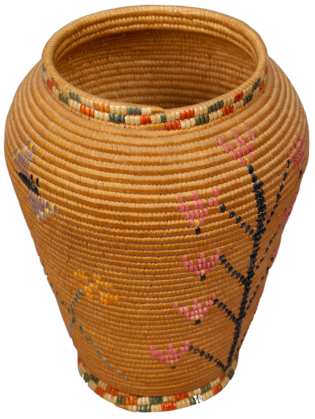 It was part of a collection of baskets and donated to the MOA several years ago. I was excited to share this one I have (pictured below) with MOA staff member recently. 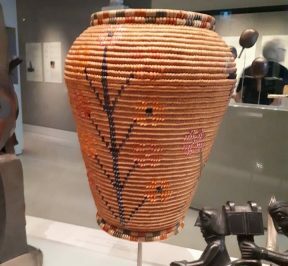 We compared the similarities with the basket they have displayed currently in the Gallery of Northwest Coast Masterworks. It is displayed with some of the greatest First Nation artists work of all time! It is currently labeled as Stolo? with Artist unknown. 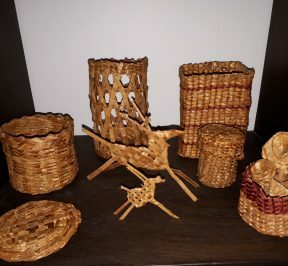 My Great Grandma Christine made both of those amazing baskets! 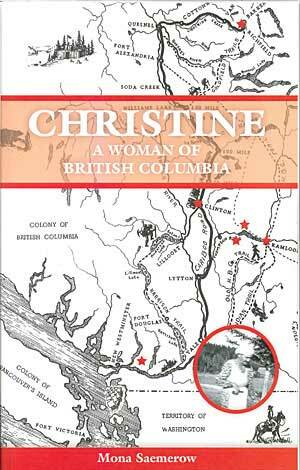 I look forward to the day when it is properly represented as Secwepemc and attributed to my Great Grandma Christine. 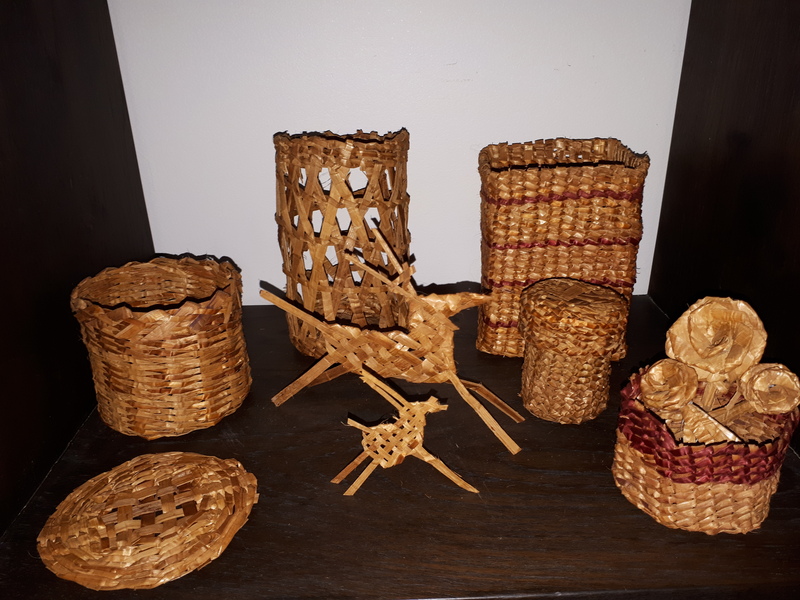 I am currently weaving cedar baskets and hats myself. I am finding it to be a very therapeutic, grounding and a wonderful way to connect to the many gifts from the tree of life. 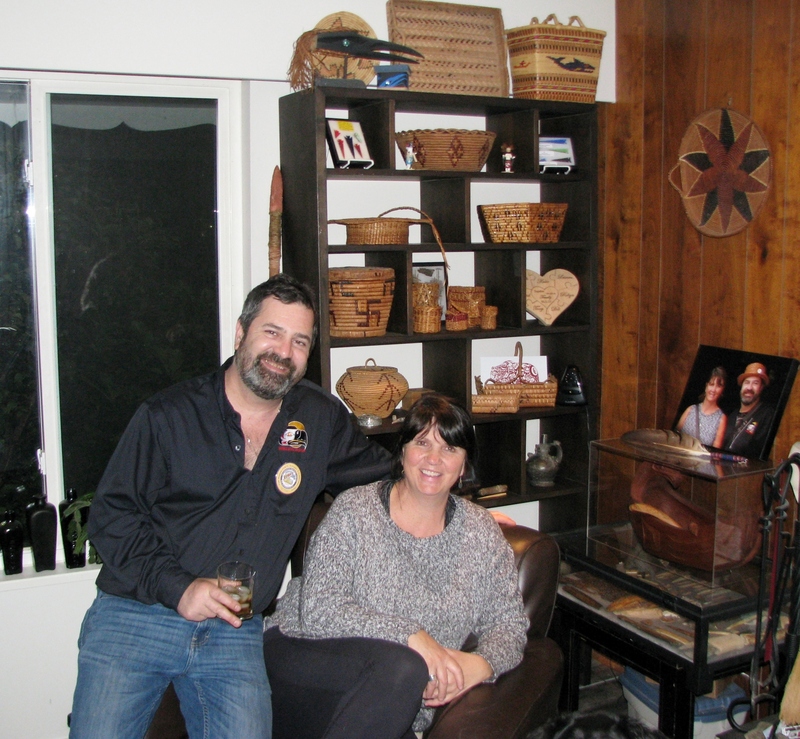 I just wanted to express how grateful I am for the knowledge and weaving instruction Todd Giihlgiigaa DeVries provided myself, my wife and some of our friends as well as the many others at his public drop in weaving classes held in Vancouver on Tuesday nights. For me it has truly been a way for me to connect with my ancestors. 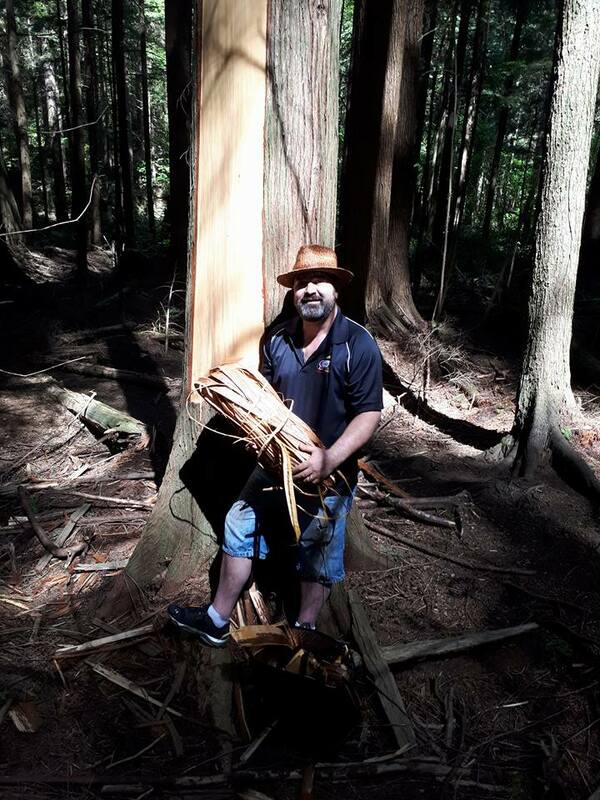 I feel my Great Grandmother the master Secwepemc weaver Christine Hardie herself smiling down on me when I am working with the sacred cedar tree bark. It is a connection to the creator and the earth. It is very grounding and therapeutic. It is truly the tree of life, and learning this first hand has made my presentations so much more authentic and engaging. 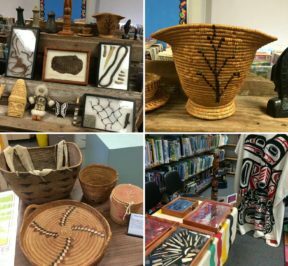 It is amazing to teach of this wonderful Superstore of a tree and our ancestors ways of creating so many items and products from her. 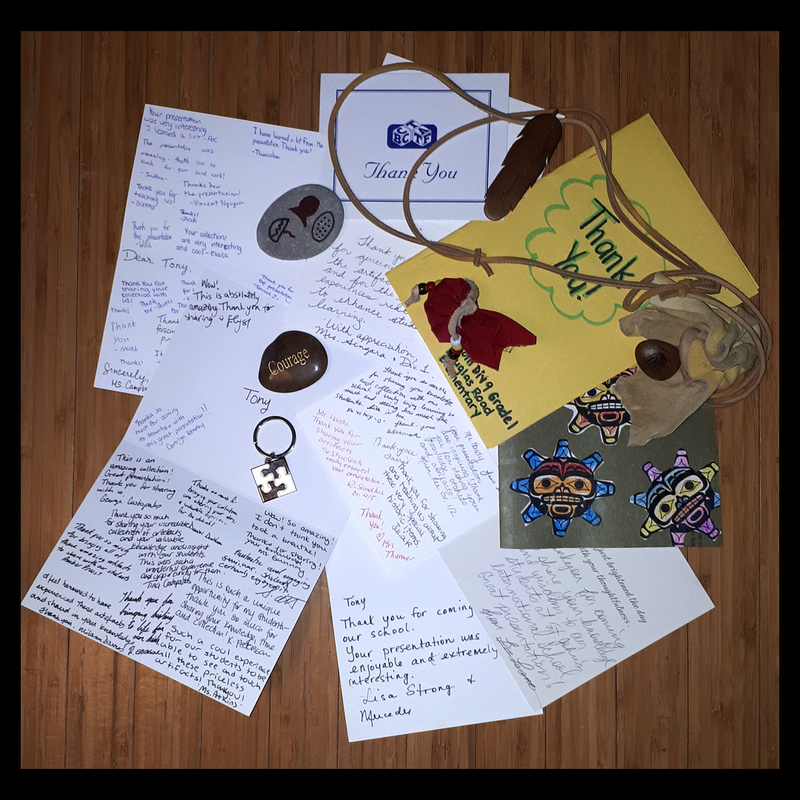 Haw’aa my friend, I am forever grateful for this amazing gift you shared with me that I now share with students and teachers on the BC Artifacts Mobile Museum Tours. 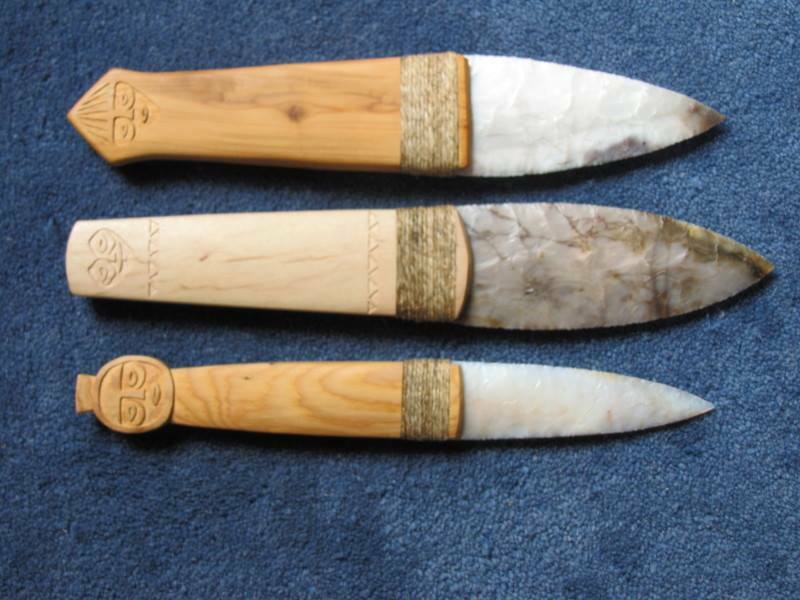 The Mobile Museum is excited to add two of these three Lower Columbia River Chinook/Salish First Nation style replica knives created by Steve Alley 2018 to the mobile Museum educational displays and tours. 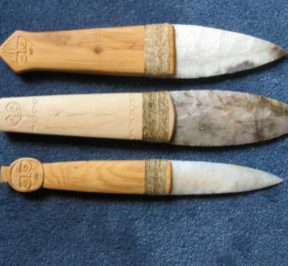 The middle one with the maple handle is probably the most accurate example with classic Tsagiglalal, “She Who Watches” motif carving still looks out across the Columbia River from the basalt cliff where she was painted by Chinookan People somewhere between the years 1700 and 1840. 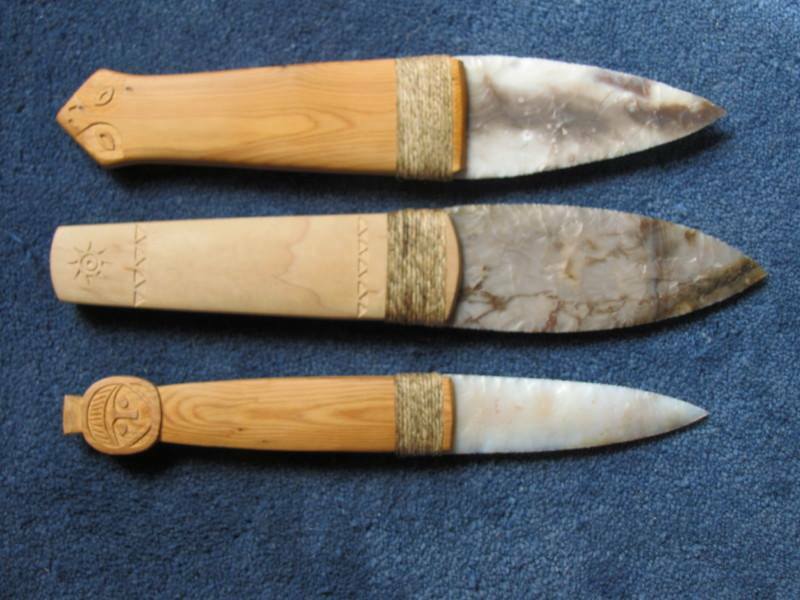 The other two knives have yew wood handles and traditional agate blades. This spectacular pictograph was created using mineral pigments pulverized from rock. 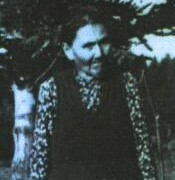 Chinookan peoples include several groups of indigenous First Nations people of the Pacific Northwest in the United States who speak the Chinookan languages. In the early 19th century, the Chinookan-speaking peoples resided along the Lower and Middle Columbia River from the river’s gorge downstream to the river’s mouth, and along adjacent portions of the coasts, from Tillamook Bay of present-day Oregon in the south, north to Willapa Bay in southwest Washington. In 1805 the Lewis and Clark Expedition encountered the Chinook tribe on the lower Columbia. 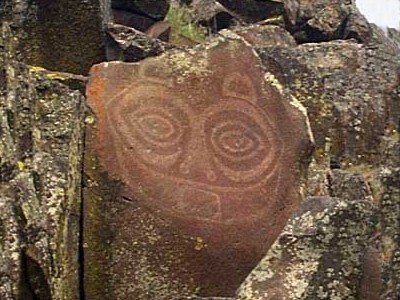 The name ″Chinook″ came from a Chehalis word Tsinúk for the inhabitants of and a particular village site on Baker Bay. 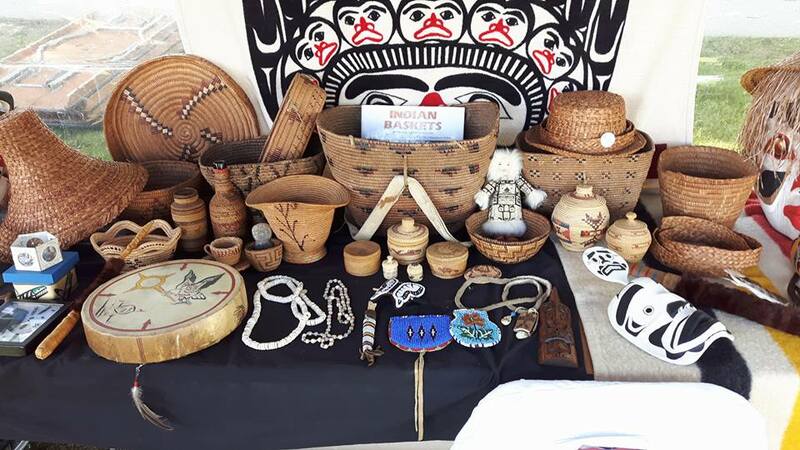 This year, the BC artifacts Mobile Museum will visit and present on the traditional territories of the Nlaka’pamux, St’át’imc, and Secwepemc First Nations. 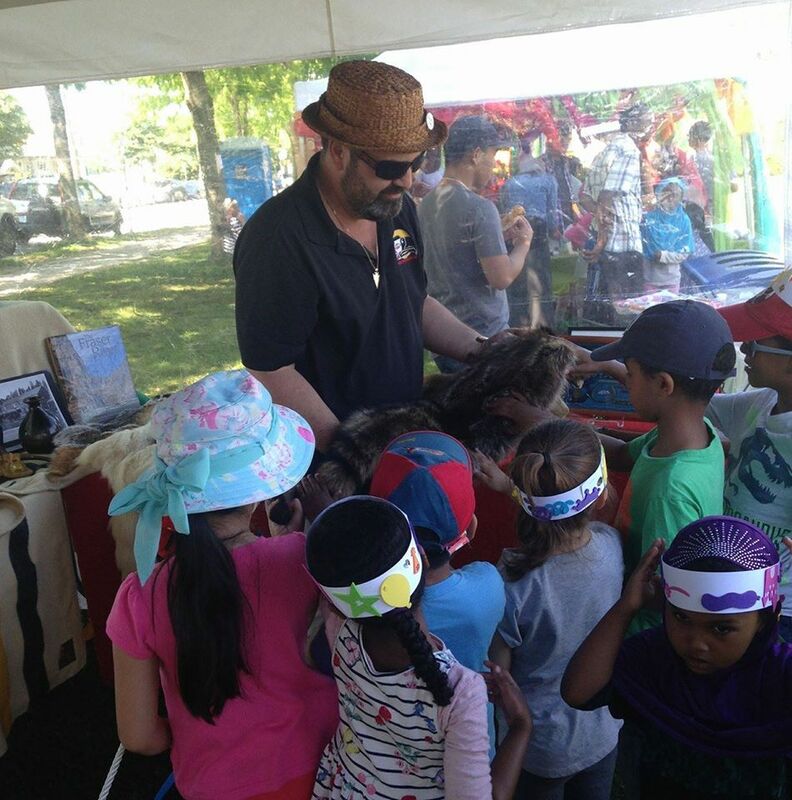 This Wednesday the 21nd the Mobile Museum will be in Lillooet presenting for the T’it’q’et to Cayoosh and George Murray Elementary staff and students followed by a community presentation in the evening at #59 Retasket Street from 5pm till 7pm. 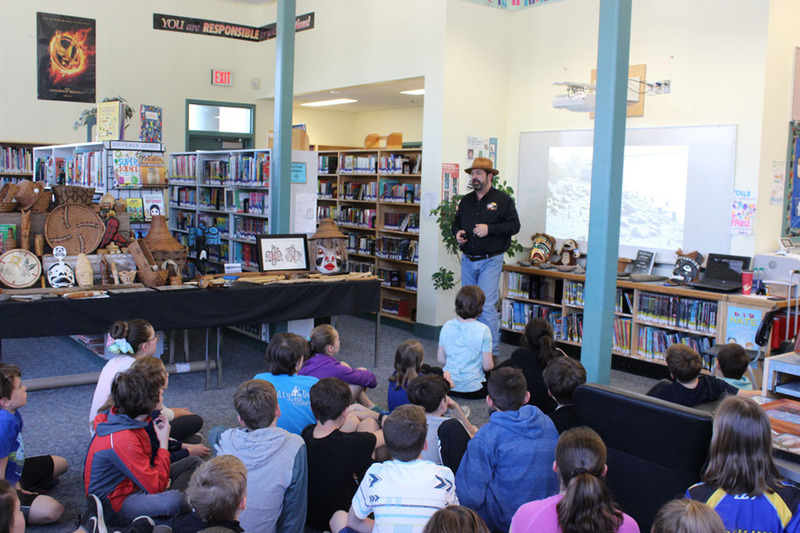 Thursday the 22nd presentations will continue for Cayoosh and George Murray Elementary students followed by presentations for Lillooet Secondary Grade 9 Socials and Statimc Class as well. 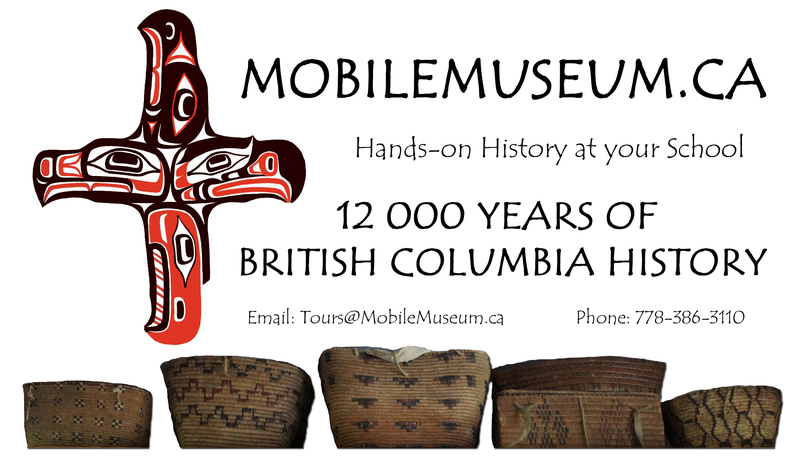 This April the Mobile Museum will be in Lytton at Kumsheen Secondary presenting to Grades 8-12. 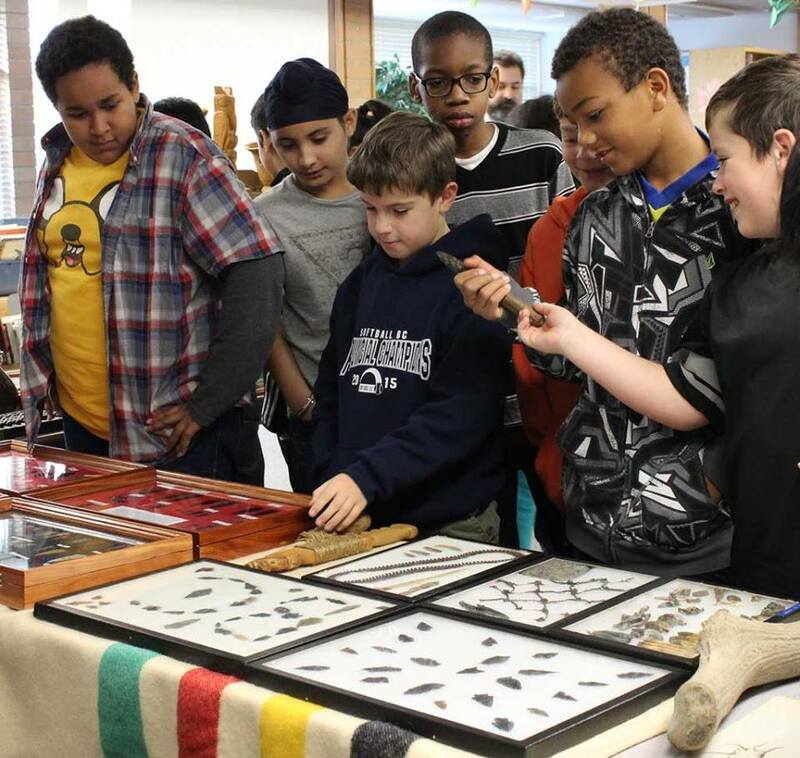 Later on in the month on the 25th and 26th Mobile Museum is scheduled to be in the Shuswap at Salmon Arm presenting to students and staff from several schools including the Shuswap Middle School. April and May Mobile Museum Tour dates are filling up! February and March bookings dates are now Full! 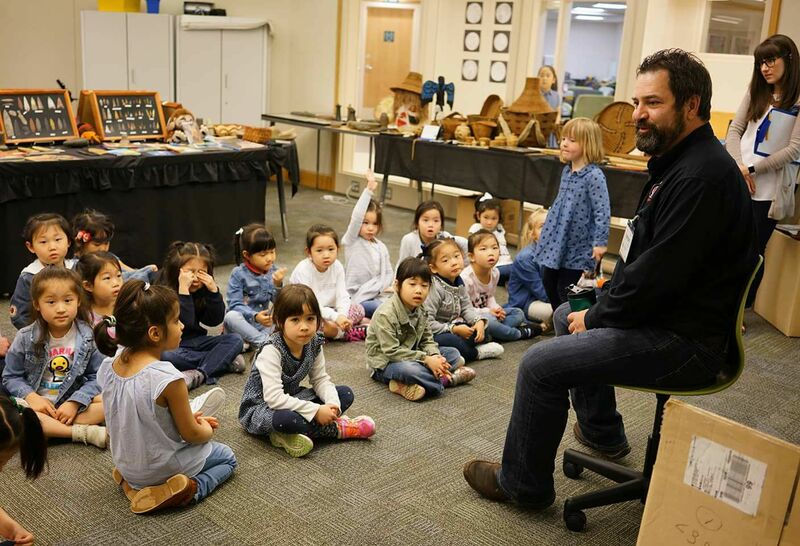 April and May Museum Tour dates are filling up! 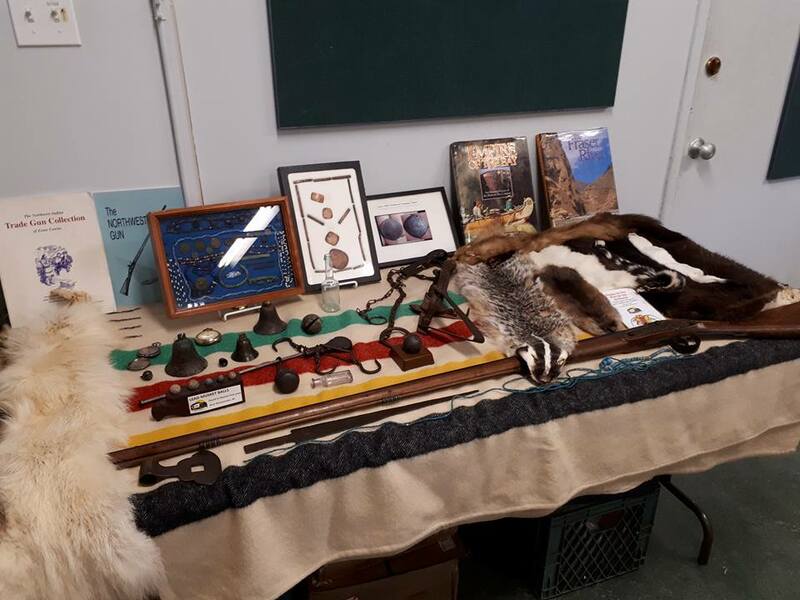 The BC Artifacts Mobile Museum Tours consists of an extensive collection of authentic First Nations, Pioneer, Fur Trade, and BC Gold Rush artifact displays as well as a very engaging and informative Power Point presentation. Presented by Tony Hardie descendant of early British Columbia Pioneers and the Secwepemc(Shuswap) First Nation. 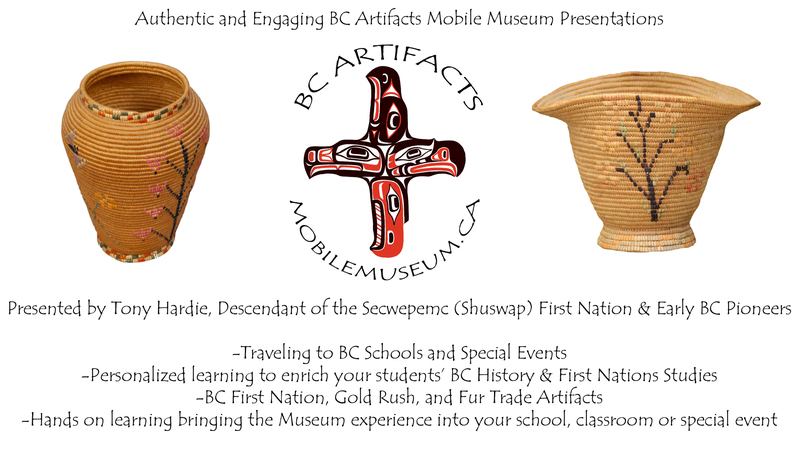 The BC Artifacts Mobile Museum is currently presenting at BC public and private schools, community events and more! Don’t Miss out! Book your tour Today! Bookings are still available for 2018! 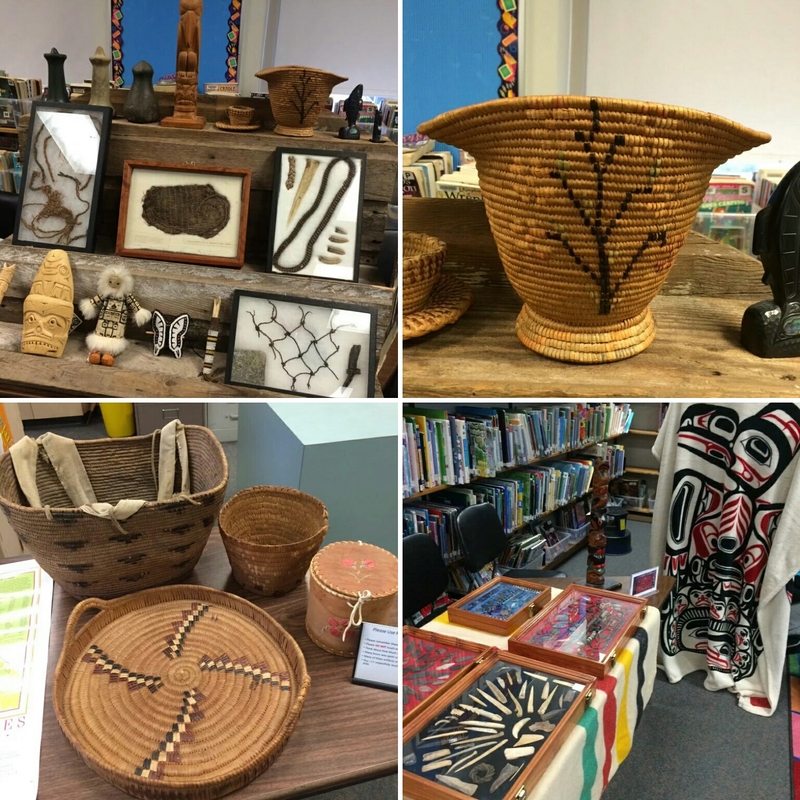 The BC Artifacts Mobile Museum is currently Presenting at BC Schools, Community Events and Elder and Senior Retirement Homes. Please visit the www.MobileMuseum.ca website for more information, references and booking availability.